The Clarke Historical Library staff was recognized for its contributions to CMU’s Annual University Campaign (AUC) at a University-wide ceremony on April 2. The AUC is an opportunity for the faculty and staff of the University to "invest in the continued success of CMU." Faculty and staff are asked to volunteer monetary donations to the campus unit of their choice. To sweeten the deal, the University contributes $1 for every $2 donated to the AUC. 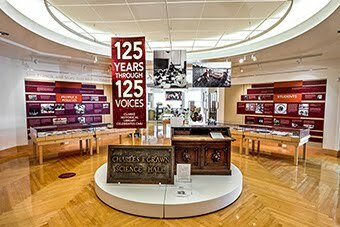 Last year, we posted a similar Clarke Historical Library News and Notes blog entry about the same recognition bestowed upon the Clarke staff. Just like last year, we were recognized for having the highest percentage of donors for a CMU unit with less than twenty-five employees. This marks the fourth year in a row that this award has been won by the Clarke staff. Insofar as we can determine, this also represents the longest continuous period that a unit has won this award. So hat's off to the Clarke staff for their goodwill and generosity, whether as part of the Annual University Campaign or in their daily approach to everything they pursue! With the Spring Semester wrapping up at Central Michigan University, the Clarke will be changing our Saturday business hours for the summer. This Saturday, April 20, will be the last Saturday until September that the Clarke will be open. We will keep the same 8 am to 5 pm, Monday to Friday hours. If you have any questions about our hours of operation, please call 989-774-3352. Sometimes you plan for months or even years to make possible a major, new acquisition. Sometimes a major, new acquisition is a mad scramble. Three weeks ago the library staff scrambled, successfully, to acquire a treasure; a scrapbook created by Grace Hall Hemingway for her daughter, Ursula covering the years 1913-1916. As many of you know, over the last several years the library has built a strong collection relating to the years Ernest Hemingway spent in northern Michigan. Ernest was the second child born to Grace Hall Hemingway and her husband Clarence Hemingway. Ernest's sister Ursula was the third child born into the family. Mother Grace dutifully kept scrapbooks for each of her children. Each book was rich in documentation regarding the family’s annual stay at their summer cottage along Walloon Lake, full of personal notes and family photographs. The scrapbooks are a picture of early twentieth century cottage life “up north,” a cottage life one of America’s great authors drew upon extensively in writing the Nick Adams stories. Photo album, approximately 7½x10¾”, consists of 100 pages of family memorabilia including approximately 121 original family sepia-silverprint photographs ranging in size from 2x4” to 7x8”, most are 3x5½" or period postcard size. Nearly every photograph in the album is identified in Ursula Hemingway’s very fine and readable hand, often to the length of a short paragraph. Hemingway family photograph and memorabilia album put together by Ernest Hemingway's younger sister, Ursula. Noted on the flyleaf in her hand as “Ursula Hemingway, Book IV from July 1st 1913 to July 1st 1916, Eleven years 2 months to Fourteen years and 2 months old”. The photographs well document the Hemingway family during the early 1910s, with images of children partying, family dinners, group images before the city house, and the Walloon Lake summer house in Northern Michigan that the family loved and that was so much a part of the Hemingway life. There are photographs of the Hemingway grandparents, the father, Dr. Clarence Hemingway, (including a 1914 photograph of him with his famed “Tin Lizzie,” from which he made his legendary house calls), and a wonderful image of the family Thanksgiving dinner at the Grandparents. 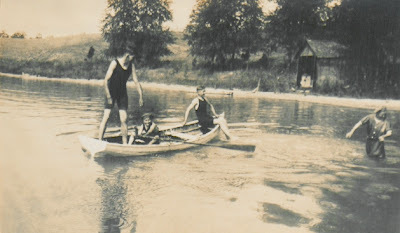 There are approximately 21 images showing the young Ernest, many in group family shots, some individual pictures with him as the young fisherman holding trout, playing on the waterfront in and around boats and canoes. One small portrait photo is a terrific image of the smiling young Ernest. During this period the last and youngest Hemingway child, Leicester, was born, and there are a number of photos of him in his infant years, as well as his printed birth announcement. Scattered throughout the album are numerous programs of recital, school, and church events in which the Hemingway children participated, approximately 25 letters in envelopes and postcards mailed to young Ursula, approximately 30 pieces of original art by Ursula, who would become an accomplished artist in her later years. A 12 page holograph diary of a trip Ursula took with her mother, Grace, to Nantucket in 1914, along with photographs and an original miniature watercolor presented to Ursula by the Nantucket artist Marianna Van Pelt. One wonderful photograph is labeled as “the 6 children taken together for the first time”, complete with a smiling Ernest and everyone in their Sunday best. Ursula learns the typewriter, and makes a list of all the family at a Walloon Lake birthday party, including Ernest. Another photograph shows Grace and Dr. Hemingway’s 19th wedding anniversary with all 6 children together, 3 letters laid in, are written from Ursula to her mother at Walloon Lake, along with a separate note to “Ernie”, and much more. Ursula Hemingway, (1902-1966), graduated from Carleton College in Minnesota where she met her future husband Jasper Jepson. After marriage in 1925 the Jepsons settled in Honolulu where Mr. Jepson was a Vice President of the Bishop Trust. Ursula became a recognized painter and the Jepsons had one daughter. It was through this daughter's family that this Hemingway family material descended until the present. A remarkable survivor and truly unique archive of items that document the early life of Ernest Hemingway and his family in the Oak Park, Illinois and Walloon Lake years. Actually the auction house had it slightly wrong – the handwriting was that of Grace Hall Hemingway, not Ursula, but the overall description was accurate, and tremendously exciting. As the saying goes, “they aren’t making any more of these,” and Hemingway family scrapbooks are a fascinating window into the experiences that directly shaped the writings of one of the ten Americans who have won the Nobel Prize in literature. Bryan had been looking through the catalog on March 13. The sale was on the next day. That left us a little less than twenty-four hours to find the $10,000 to $15,000 which the auction house estimated the item would “fetch” in the language of the business. Fortunately over the years the Library has developed a network of Friends very interested in the Hemingway collection. A long day’s worth of phone calls and emails found support from eight donors, which, when joined to money “in the bank” and made available from the Friends of the Libraries annual giving fund and also spendable income from the Clarke’s own endowment, made the purchase possible. We are thrilled to have acquired Ursula Hemingway’s “up north” scrapbook, and extremely grateful to all of those who helped make the acquisition possible. Drop by and see it one day – you’d never guess, just thumbing through the volume, that the good looking young teenage boy in the pictures was destined for greatness, but in retrospect carefully inspecting those pictures, and the rest of the book, offers important insights into the experiences that shaped the writings of Ernest Hemingway. On the evening of April 10, approximately 100 people attended the premiere of The Road to Andersonville, a documentary regarding the service of the 139 Native Americans during the Civil War in Company K, First Michigan Sharpshooters. 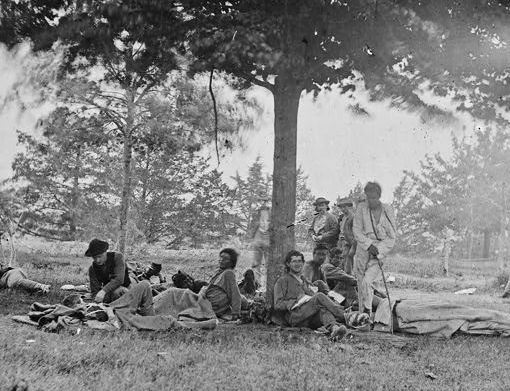 In 2010, members of the Anishinabe Ogitchedaw Veteran and Warrior Society traveled to Andersonville, Georgia in order to perform traditional burial ceremonies for the seven men from the Company who died and were buried at the Confederate Prisoner of War camp located there. 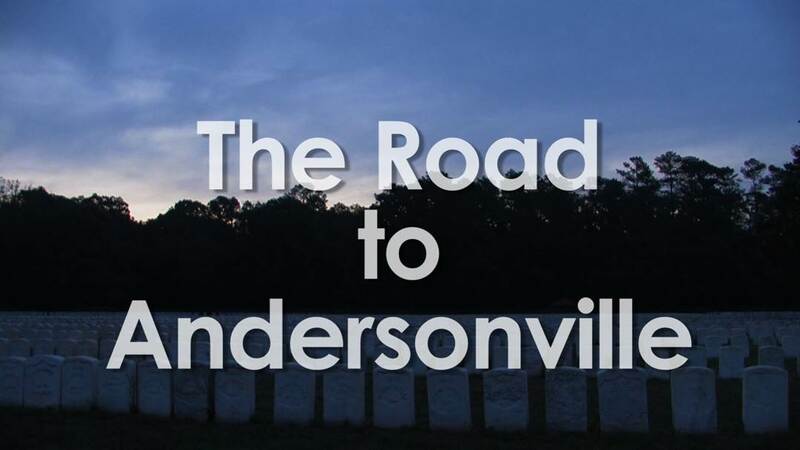 The documentary tells the story of Co. K from two perspectives – the story of those who traveled to Andersonville in 2010 and the remembrances of descendants of the men who served in the company as well as a narrative by two historians who have studied the company. For the men of Company K, simply serving was a challenge. Native Americans were originally excluded by state law from being recruited into Michigan military units. Eventually, wartime necessity led the State to lift the ban on Native American recruits, and Co. K, largely made up of men from the Little Traverse Bay area, became one of the few Native American units to serve the Union cause. Company K, like all of the First Michigan Sharpshooters, saw hard service. The men of Company K fought bravely and well. One example of the bravery shown by the men of the Company was Pentwater Chippewa Antoine Scott, who was nominated for the Congressional Medal of Honor for his heroism at the Battle of the Crater on July 30, 1864. 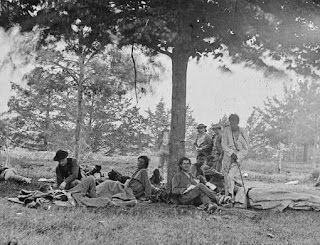 Fifteen of the men who served with the Company became prisoners of war at the infamous Confederate prison at Andersonville. Eight died. Seven were buried at Andersonville, while the eighth died in transit to another POW camp, and lies in an unknown grave. The trip in 2010 was both a recognition of these men’s valor and sacrifice as well as a spiritual quest to perform the traditional rituals believed to assist them in their passage through the western gate. We are especially grateful to David Schock, the film’s producer, for the effort he has invested in telling this story. Thanks also to Dave Herek and Chris Czopek, who served as historical consultants, and the members of the Anishinabe Ogitchedaw Veteran and Warrior Society, who traveled to Andersonville to perform traditional ceremonies over the graves of their fallen brothers, and who honored us with their presence and opening ceremony at the film’s premiere. The documentary telling the story of Company K was made possible, in part by a grant from the Michigan Humanities Council. For more information about the film, please contact the documentary’s producer, David Schock, at schock@charter.net.